There is just a few days left to save big on my new class at Altenew Academy, Seasonal Scene Building! Enrollment is open NOW! Enjoy a special early bird discount when you sign up for the class from now till May 15th. Use “ssbc20off” when checking out. Each lesson goes live at 12am EST, each day of the interactive class period. Live Q&A Session with the teacher and other students! Exclusive class forum for you to interact with others and share ideas! 6 in-depth, step by step video tutorials with exclusive projects! Various techniques to add colors to your projects and make them fun and exciting! Student gallery page with fresh inspirations from other students taking the class! Click HERE to watch the video trailer for the class and to sign up today! I'm so excited to share that I'm teaching the May Class for Altenew Academy, Seasonal Scene Building! The class starts May 16th and there are six lessons, video tutorials for each lesson, and bonus content and videos for every lesson. Enrollment is open NOW! Enjoy a special early bird discount when you sign up for the class from now till May 15th. Use “ssbc20off” when checking out. Please be sure to check out the sale page for more info, a video trailer for the class and to purchase NOW! Take $25 off any order at Simon Says Stamp now through 5/8/16 at 11:59 pm EST. Use code MOMSROCK. From today (Friday, 5/6/16) through Sunday (5/8/16), Ellen Hutson is offering a 20% discount on all orders! Use code momsday16. - No ccombining multiple orders (due to the sheer craziness of this event). I am working on some super exciting new projects that I can't wait to tell you about but in the meantime t I wanted to pop in here real quick and let you know that Jennifer and Kristina are letting me give away three spots in their new Online Card Classes Sheer & Clear class! I am so, super excited about this class (in fact my sheer and clear card was shared today in class!). I know this is last minute and class has started so if you would please leave a comment on this blog post by this Friday, April 29, 2016, 11:59 p.m. CST, I'll get winners drawn and notified so you can get right into class and start enjoying it! The city sidewalks are all dressed up in holiday style and in the air there’s a feeling of celebration. Online Card Classes is here to help you get started with an ALL NEW holiday card class: Holiday Style! Online Card Classes is generously giving me the opportunity to give away one spot in their newest class, Holiday Style! Please leave a comment on this post by Tuesday, November 10th, 2015, 11:59 p.m. CST for a chance to win registration into this class! Winner will be notified via email so please make sure and leave a valid email address! Thanks and good luck! Welcome to a special blog hop hosted by several of us paper crafting instructors at Craftsy, an online classroom platform that includes classes on scrapbooking, card making, paper crafting and much more! Spend a little time getting to know each instructor on this list and the classes they teach through Craftsy. You'll discover that some of your favorite teachers are now offering classes through this incredible platform. Look for special giveaways from the instructors! Leave a comment on the participating blogs for your chance to win. Then join us on Craftsy for inspiring new ways to craft and learn! I have has been paper crafting for more than 17 years. I am a “Creating Keepsakes Hall of Fame” winner and currently designs for Mama Elephant, Lawn Fawn, Simon Says Stamp, Pretty Pink Posh and Kerri Bradford Studio. I love sharing new projects on my blog. I am passionate about stamping, die cutting and getting the most out of my supplies — an enthusiasm that’s always present in my teaching. Learn how to incorporate memorable greetings into your cards using repeated background sentiments, floating greetings, embossed resist techniques and more — all with tips and techniques from professional cardmaker and instructor Nichol Magouirk. Discover the secrets to achieving embossed texture without any actual embossing, and find out how to use masking to create a slick new set of stamps without spending a dime. Make elegant landscape scenes, and stamp on vellum for a background with a soft effect. Hand-color stamped and die-cut embellishments, and embrace the latest in paper craft trends with embossed ombré greetings. You’ll even experiment with stunning watercolor and painterly effects for cards that are memorable masterpieces. Click HERE to watch the trailer for my class, Gorgeous Greeting Cards: Stamping & Beyond. Leave a comment on this blog post by Thursday, July 16, 2015, midnight EST for a chance to win my class, Gorgeous Greeting Cards Stamping and Beyond. Winner will be notified via email the morning of Friday, July 17th. Nichol Magouirk <--- you are here. I'm just popping in here quickly today with some weekend enabling. I've been using the MISTI Stamping Tool in many of my videos and it's back in stock at Simon Says Stamp HERE. This tool is a must if you love creating multiples of a card design. Check out THIS video and THIS video to see the MISTI in action. I just ordered the Minc Foil Applicator Starter Kit HERE and can't wait to get started foiling everything! True Stamp 2015 Individual Classes are now available! 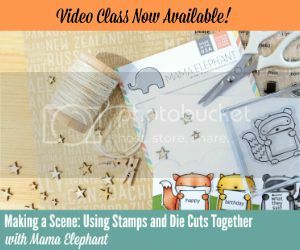 From now through midnight on MONDAY, JUNE 22 get these inspiring video classes, including my Mama Elephant Class: Making A Scene, for only $9.95! Love stamping? Get the entire event, all six classes for only $39 (that's $6.50 each) with the code "SUMMER". Hurry, prices increase to $14.95 after 6/22! Click HERE to start shopping. Join May Flaum and Friends for Camp Scrap 2015 coming this July (I am a card contributor!). Click HERE to read all about it and to reserve your spot for just $30. This is a great way to get that creative mojo going this summer! I've had several requests and questions regarding the Zig Clean Color Real Brush Markers. Whether I recommend the sets or buying them individually and to provide a list of my favorite marker colors. I chose to purchase mine individually so that I could pick and choose the colors I wanted however the sets are a great option, if you are wanting to try the markers out and don't want the hassle of choosing. Either way, I don't think you can go wrong. The markers are fantastic! Also, you do not need all the colors (unless you want to, of course!). Lots of the colors can be watered down which changes the color, combining a couple of colors of markers together, changes it to a third color. Below are links to the sets available if you want to go that route and also the individual marker colors that I own and love. I hope this makes it easier if you're trying to decide what to buy. Pretty Pink Posh has restocked all the out of stock sequins and is having a big 3 day SALE! Save 15% on all in stock sequins using code: "pretty15". Click HERE to shop now. I've been getting lots of questions on my blog and youtube channel asking about the jewelry (rings + bracelets since that's all you can really see!) that I'm wearing. Nine times out of ten, it's Stella & Dot Jewelry (my absolute favorite). I've linked up the pieces they currently have in stock that I own. The quality is superb and everything I've purchased has held up wonderfully. I am not a stylist for them, just a very happy customer! Renegade Cluster Bracelet (I own it in both silver and gold). Stella & Dot pieces I own and wear. Affiliate links used. Are you a Pinterest fan? I love being able to pin my favorite ideas found around the web. I've been working (and will continue to work) to add my projects to new boards making it easier to find past projects. I like the idea of having all my Lawn Fawn projects in one place on the Lawn Fawn Board, etc. Check it out HERE at Pinterest. TRUE STAMP 2015 INDIVIDUAL CLASSES FOR SALE! *This is 1 of 2 blog posts today. For the Simon Says Stamp July Card Kit post, click HERE. The True Stamp 2015 Individual Classes are now available for purchase! Whether it’s a birthday, wedding, or anniversary, have your gift recipient saying “WOW!” before she even opens the package. First impressions count, so let’s have some fun adding stamped elements to your gifts. Join Kelly Marie Alvarez and Chari Moss from Lawn Fawn in “Wrap It Up: Adding Stamped Elements to Your Gift Packaging” and learn how to use stamps to create adorable gift packaging so cute and clever they won’t want to throw it away! With your purchase you’ll receive two videos: A 32-minute project-only video, and a 50-minute “Like You Were There” replay, including chat and Q&A. "Great class, beautiful cards" --Diane G.
much into a video!" --Karen G.
Make a scene with Nichol Magouirk of Mama Elephant! Using the same supplies, join Nichol as she tackles two different styles of creating the perfect scene with stamps and die cuts. She’ll show you how easy it is to create a clean and simple scene in a card that packs a punch or step it up a notch with intricate layers and details that will surely make your jaws drop! With your purchase you’ll receive two videos: A 40-minute project-only video, and a 60-minute “Like You Were There” replay, including chat and Q&A. Sneak peeks of cards from the Mama Elephant, Making A Scene, True Stamp 2015 class. Mini stamp sets are adorable, cost-effective, and fun – but they can be tough to use! Let the amazing Laura Bassen for Paper Smooches teach you how to highlight those tiny treasures so they’re shown off to their best advantage. In “Tiny Treasures: Little Stamps, BIG Results,” you’ll learn lots of fun ways to use these wee gems on paper crafts, gifts and party ensembles, so you get BIG results, no matter how small the stamp! We’ll show you eye-catching and creative ways to stretch your little stamp sets even further than you imagined. With your purchase you’ll receive two videos: A 30-minute project-only video, and a 50-minute “Like You Were There” replay, including chat and Q&A. One of the easiest ways to add polish and to your papercrafting projects is by adding dimension. But forget the wonky glasses! In “Dare to be 3D: Adding Dimension to Your Stamped Projects,” Raisn Boat’s Bobbi Lemanski and Kim Ziehr will teach you how to take your projects from one-dimension to three-dimension in minutes! In this “in-depth” look, explore ways of making your projects literally stand out by combining stamped designs with boxes, bottles, coasters and more to create one-of-a-kind, 3D gifts and greetings. With your purchase you’ll receive two videos: A 34-minute project-only video, and a 57-minute “Like You Were There” replay, including chat and Q&A. Are you a stamper? Cardmaker? Scrapbooker? All of the above? Whatever your crafting pleasure, we’ve got one thing in common: Our awesome supplies! In “To Infinity and Beyond! Out-of-This-World Uses for Stamps and Crafting Supplies,” Shari Carroll of Simon Says Stamp is boldly taking us where no crafter has gone before. In this class, you’ll explore the endless possibilities using your crafting supplies and tools in new and different ways to create super-cool DIY projects. Ignite your booster rockets and prepare to lift off! With your purchase you’ll receive two videos: A 30-minute project-only video, and a 56-minute “Like You Were There” replay, including chat and Q&A. Gold is a hot trend in fashion, home décor, and papercrafting too. In this “Go for the Gold: Using Metallics for Maximum Impact” from Technique Tuesday founder Bev Grey, you’ll explore ways of adding gold in both big and small doses to your stamped images and papercraft projects. Bev will show you how to add little pops of gold to make any project extra-classy, from including a glimmer of gold for a little contrast, to getting sassy with big, bold, gold stripes. From modern elegance to ultra-hip, the gold techniques you’ll learn are mind blowingly fabulous, yet easy to do. You’ll be ready to go for the gold on your next project. With your purchase you’ll receive two videos: A 42-minute project-only video, and a 64-minute “Like You Were There” replay, including chat and Q&A. It's been a huge release week, with many of my favorite companies releasing amazing new products. With so many incredible products I thought I'd share what I personally picked up and share the releases so you can decide what needs to come home and live with you. (wink, wink!) Things like awesome stamps like the adorable giraffes from wplus9 Party Animal Stamp Set, the fabulous phrase from the wplus9 Dreams Into Plans Stamp Set, more cute critters from the wplus9 Happy Mail Stamp Set, the cutest penguins from the My Favorite Things Penguins In Paradise Stamp Set and all the awesomeness from the Lawn Fawn Release. I'm a sucker for all cute critters. You guys probably already know that about me! The letters below the thumbnails below link to stores where you can purchase the products shown in this post and video: SSS = to purchase from Simon Says Stamp, EH = to purchase from Ellen Hutson, MFT = to purchase from My Favorite Things. Affiliate links used. Make something that defies expectations and lasts for generations! This weekend only, save on ALL online-video Craftsy classes, and gain the skills you need to create something you can showcase forever, with lessons you can access forever. Don’t wait to make something great. Event ends Sunday - shop now! Click HERE to save on all online classes, this weekend only: Friday, 6/5/15 - Sunday, 6/7/15 11:59 PM MT. Be sure to check out my Craftsy class, Gorgeous Greeting Cards: Stamping & Beyond. Learn how to incorporate memorable greetings into your cards using repeated background sentiments, floating greetings, embossed resist techniques and more — all with tips and techniques from professional cardmaker and instructor Nichol Magouirk. Discover the secrets to achieving embossed texture without any actual embossing, and find out how to use masking to create a slick new set of stamps without spending a dime. Make elegant landscape scenes, and stamp on vellum for a background with a soft effect. Hand-color stamped and die-cut embellishments, and embrace the latest in paper craft trends with embossed ombré greetings. You’ll even experiment with stunning watercolor and painterly effects for cards that are memorable masterpieces. Need to freshen your stamp supply? Head over to the Craftsy supplies page for an inspiring selection of stamps, paper, tools and more! Be sure to check out the Pretty Pink Posh Blog Hop and leave comments on every stop along the hop for a chance to win one of the great prizes! If you enjoy watercoloring, please be sure to link up your watercolored card too. Visit the Pretty Pink Posh Blog for more details. Missed one of my projects showcasing the new Lawn Fawn products? Check out THIS post for a full recap. I received compensation for any class purchases through affiliate links. Although this post is sponsored, all opinions are my own. Learn stash-busting secrets for playful patterned pages that amaze, all with guidance from designer and renowned instructor Paige Evans. Discover techniques for artfully tearing and layering paper strips for richly textured pages, create custom, intricate cutouts using your electronic cutting machine and learn both hand- and machine-stitching methods for one-of-a-kind results. Then, explore beautiful backgrounds as you master a variety of cutting techniques, layer your paper for a stylish ombré effect and even roll out paper strips to mat or frame favorite photos. Plus, use watercolors to create the paper you've always dreamed of and play with tone-on-tone backgrounds using spray mist and a doily for imaginative, eye-catching results. Learn how to use your Silhouette CAMEO, and all of the features that it has to offer! Join renowned designer and scrapbooking pro Paige Evans, as she walks you through the basics — and beyond — of your machine. First, get to know your Silhouette Studio® software, so that you get the most bang for your buck! Next, bring the designs of your dreams to life on your Silhouette, and up the “wow” factor of every page or card with impactful titles and intricate shapes. Then, Paige breaks down the art of cutting, both using a machine and by hand, for elevated designs. Think intricate paper cuts are all your CAMEO can create? Think again, and learn how to use advanced functions like sketch pens, fabric and vinyl cutting, and even the Print & Cut and PixScan™ feature to cut perfect borders around a stamped or printed image! Plus, gain access to Paige’s exclusive designed cut files in your class materials! 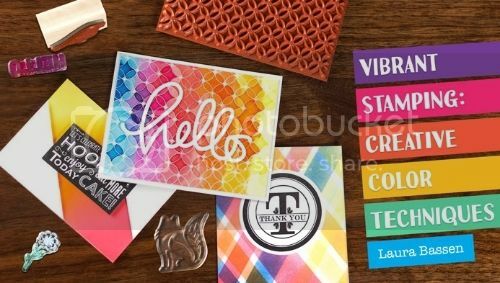 Create your most colorfully stamped cards yet with professional cardmaker Laura Bassen. Learn Laura's special masking techniques for clean and simple designs. Then, blend multiple colors for a flawless gradient effect that sets your cards apart, and incorporate modern trends such as ombré into your cards with ease. Confidently create a complex plaid pattern and learn how to mask floral arrangements and animal images for cards with impressive depth. 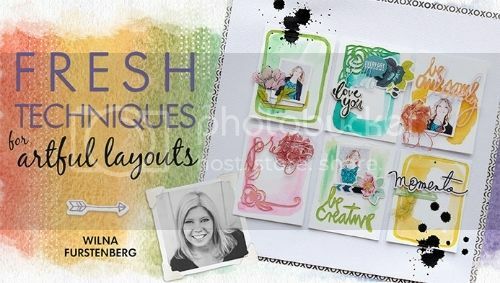 Next, ramp up your designs with emboss-resist techniques and even simulate the artistry of watercolor paintings on your cards with Laura's "smooshing" technique! Finally, create remarkable patterns with multicolored embossing powders and enliven your stamped images with Copic markers. Discover how to build artful scrapbook layouts with guidance from renowned artist and scrapbook designer Wilna Furstenberg. First, discover how to create colorful layouts by adding layers with rub-ons and pigment sticks such as Gelatos. Then, get playful with wax crayons, learn how to use unique stencils you create by hand or with a cutting machine, and confidently work with clay! Up next, find out how to create texture and dimension using stamps and make embossing plates for inked letterpress impressions that are a memorable addition to any page. Finally, explore silkscreen as you learn how to screen print with acrylic paints for a design that's as dynamic as it is beautiful. You'll also gain access to exclusive cut files and design tips from Wilna! 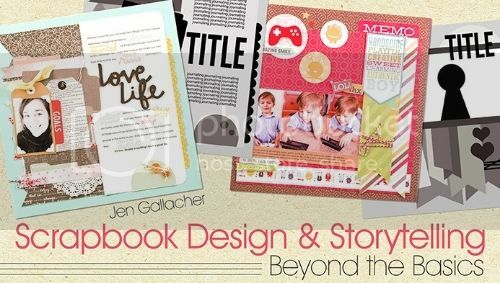 Give your story the compelling pages it deserves with step-by-step guidance from scrapbooking expert Jen Gallacher! Start by capturing the voice of your page with imagery, color and pattern, and find out how to use the same layout sketch to enliven any page. Then, play up the personality of your subjects, capture the past by giving your materials a vintage look, and highlight your most cherished memorabilia. Plus, learn how to create alluring pages, whether you're running low on photos or have too many to choose from! Discover a new approach to storytelling today and make pages you and your loved ones will enjoy for years to come. This is a sponsored post that includes affiliate links. Thank you and stay tuned for more giveaway opportunities coming soon! Nothing beats a long weekend...except for a long weekend full of crafting fun! Get everything you need for a creative “stay-cation” with Craftsy’s Memorial Day Sale. Enjoy up to 70% off all kits, fabric and yarn, up to 60% off all sewing project kits and up to 40% off art, paper craft and cake decorating supplies. You’re sure to snag the items you’ve been eyeing at major savings. SHOP NOW. 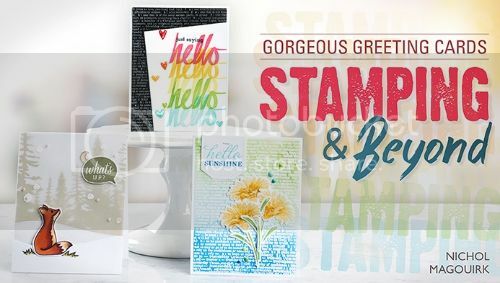 Pick up my class, Gorgeous Greeting Cards Stamping & Beyond, for $15 (that's half off!) this Memorial Day Weekend! Learn fun and unique ways of adding interesting greetings to your handmade cards. I'll walk you through seven lessons from start to finish with lots of tips and techniques along the way! Click HERE or the banner below to shop now! I couldn't resist picking up some of the Zig Clean Color Real Brush Markers after seeing so many amazing projects created with them. My watercoloring skills are not great and these markers look like they can help me achieve the look I'm going for and so much more. I can't wait to start sharing new cards colored with these! Want to pick and choose which markers you want to buy (like I did)? You can order the individual Zig Clean Color Real Brush Markers HERE from Ellen Hutson (just restocked!!!). The June 2015 Simon Says Stamp Card Kit is one of my most favorite ever! Be sure to pick yours up HERE. Click HERE and HERE to see cards I've created with the June kit. Save 20% off My Favorite Things Backgrounds & Borders today ONLY! Click HERE to start shopping or the thumbnails below for some of my favorite MFT Backgrounds & Borders.